DA Form 7766 - also known as the "Army Disaster Personnel Accountability Assessment System, Event Request" - is a United States Military form issued by the Department of the Army. The form - often mistakenly referred to as the DD form 7766 - was last revised on February 1, 2017. Download an up-to-date fillable PDF version of the DA 7766 down below or look it up on the Army Publishing Directorate website. 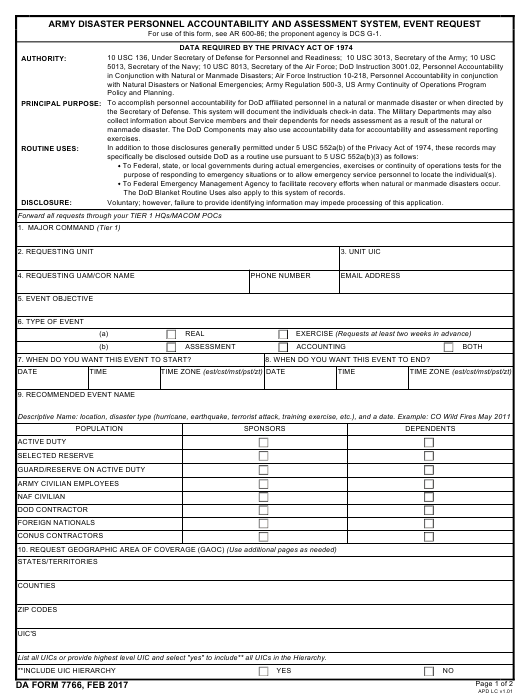 For use of this form, see AR 600-86; the proponent agency is DCS G-1. purpose of responding to emergency situations or to allow emergency service personnel to locate the individual(s). To Federal Emergency Management Agency to facilitate recovery efforts when natural or manmade disasters occur. The DoD Blanket Routine Uses also apply to this system of records. Voluntary; however, failure to provide identifying information may impede processing of this application. 7. WHEN DO YOU WANT THIS EVENT TO START? 8. WHEN DO YOU WANT THIS EVENT TO END? List all UICs or provide highest level UIC and select "yes" to include** all UICs in the Hierarchy.